Thank you for going through this – it’s incredibly helpful. One aspect of autism prevalence fluctuation is the identification of those with lower needs that account for the majority. You know, those who wouldn’t have been identified in years past. You just aren’t making comparisons far back enough. Tell me, which study from far enough back gives us a comparison to today’s numbers? Which study, using the same methods and understanding of autism, from the past shows evidence of an actual increase? I’ll answer that for you–there isn’t one. However, this study shows, that from 2000 on, the autism rate is basically flat. 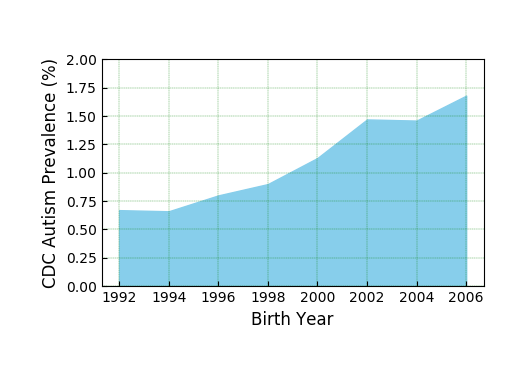 It also shows, that for kids born as early as 2000, the autism rate as higher than previous studies would indicate. All these are, of course, within the limitations of the study. BUT–the idea of an epidemic is based on such a limited logic that it is miles away from being as clear as this example. Sorry–I know the epidemic is important to those who push the idea that vaccines cause autism. I know it’s the weapon of choice for instilling fear in vaccines. I know it is the way a community of science denialists use and abuse the autism community. It’s just not an idea based in real fact. The increase in diagnoses is real. No one doubts that. But denialists who refuse to acknowledge the large number of undiagnosed and underserved autistics are directly harming the community in order to promote their own political agenda. I am not here to host links to NCSA. It’s an organization whose purpose is directly opposed to the well being of my child. So I will remove your link. NCSA is quoting a paper by Mark Blaxill. Mr. Blaxill is, well, a liar. He’s an anti-vaccine activist, science denialist and worse. He’s responsible for many disabled children being subjected to chelation. In animal models, chelation has been shown to reduce cognitive function. Be proud, NCSA. Be proud. I once interacted with Mr. Blaxill. He had written a long, convoluted and wrong post. Ironically in an area supposedly in his professional expertise, but I digress. I politely pointed out to Mr. Blaxill that his facts were wrong. I provided the evidence (easily found with a 5 minute web search). He denied my evidence (which he later used) and said he’d leave his false information up until the subject of his attack did what he wanted. Which basically showed all he was doing was (a) attacking and (b) trying to blackmail. And this is the sort of expert NCSA relies upon. They must be so proud of themselves. They’ve sunk to ally with the most unethical branch of the autism parent community. The CDDS data featured in Figs. 1, 2, 3, 4 are widely considered the most reliable long-term record of autism prevalence trends in the United States (McDonald and Paul 2010; Autism Society San Francisco Bay Area 2015). 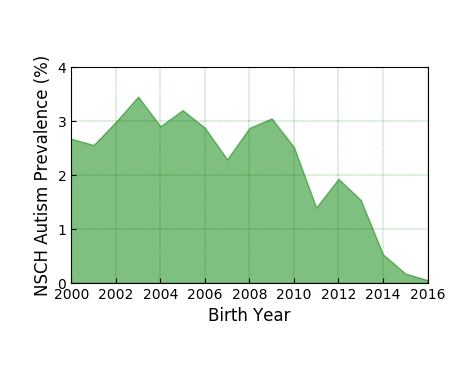 So, one minor paper and the Autism Society of San Francisco means that this is the most reliable record of autism prevalence trends? SFASA is led by one of the highly science ignorant (ironic given her hobby) people who started NCSA. CDDS has been very careful to note that their data are not the gold standard that people like Mr. Blaxill have claimed over the years. The information presented in this report is purely descriptive and should not be used to draw scientifically valid conclusions about the incidence or prevalence of ASD in California. Numbers of people with ASD described in this report reflect point-in-time counts and do not constitute formal epidemiological measures of incidence or prevalence. The information contained in this report is limited by factors such as case finding, accuracy of diagnosis, hand entry, and possible error, by case workers of large amounts of information onto state forms. Finally, it is important to note that entry into and exit from California’s developmental services system is voluntary. This may further alter the data presented herein relative to the actual population of persons with ASD in California. Mr. Blaxill was part of the community that abused the CDDS data for years, claiming it showed that mercury in vaccines cause autism. Even though he still believes that these data are so strong, he has refused to acknowledge that these data show that he was wrong about mercury. Completely and utterly wrong. And his advocacy in that regard led many parents to the world of guilt and shame, and led many autistic children to be subjected to horrible “cures” for fake vaccine injury. Well done, NCSA. Your mindset is very much like those of the vaccines-cause-autism crowd. In more ways than in shouting “epidemic” at the drop of a hat. Too bad your jobs have been to serve all autistics. Even those who were undiagnosed. By denying their existence, you failed to provide them the support they needed. Show me data that using the same methods and understanding of today that the “autism rate” for, say, 1970, is what you claim it is in the graph. You can’t. Because the data don’t exist. I’ve asked for the studies to be done. Have you? Do you give a damned about the undiagnosed, the under-served? Those going through life without the support that a better understanding of their situation brings? Or are you so wedded to an epidemic for whatever reason that you must deny this population? Why not start with accepting the possibility that a lot of autistics go undiagnosed. The possibility. Then it is incumbent upon you to advocate for better identification, because that will lead to better supports, better lives for those people. Been hearing that for a LONG time. Scientifically illiterate people have been the bane of the autism communities forever. It’s time for a change. 1) You don’t explain how that data could be biased. Also, Rimland wasn’t dogmatic about that. 2) Diagnostic criteria never excluded children with onset of symptoms at 18 months. You don’t understand how the data could be biased? Seriously, you are admitting you are that ignorant? There is no point to this discussion. No, I will not approve your comments using different email addresses. You demonstrated a lack of the basic understanding of how to analyze the information under discussion. Clearly you are just trolling here, either consciously or not. Go find someone else to “debate” with. Or, better yet, educate yourself. That is the last response you will receive here.